For many people this city is famous for its bargain hunting. For history lovers the many museums and monuments are some of the country's not to be missed star attractions. And for tourists who just want to dive into local culture, the Medina offers Moroccan life in all its hectic glory. Marrakesh is also the gateway to Morocco's High Atlas region where you can enjoy the scenic mountain beauty after your Marrakesh metropolis adventures. Marrakech literally means "land of God" and it really is a paradise for tourists. Being the second largest city of Morocco, it attracts thousands of visitors every year who come to see the stunning sights, rich culture and artwork of this beautiful place. There is a lot to see here including a number of places of historical importance, steamy hammams and sprawling mansions. Car rental is highly recommended for the visitors who want to make the most of their visit to this ‘pink city’. This beautiful city is full of luxury hotels, discount motels, Riads, and inns. The hotels of Marrakech are well known across the world for providing excellent hospitality, first-class restaurants and other services such as gyms and spas. It is easy to find the right accommodation for your tastes and budget. The major highlights of the city are Ben Youssef Medersa, Musée de Marrakech and Koubba el Badiyin, El Badi Palace, Jemaa el Fna, Koutoubia Mosque and a lot more. Car hire solutions make it easy for the visitors to access these places and to see as much as possible. Many of the attractions make it easier to find out more about the city so history enthusiasts will be in their element. The Jemaa el Fna square is one of the most famous venues of Marrakech. This beautiful square is filled with lots of activities and tourists can see storytellers, belly dancers, musicians, acrobats, henna tattoo artists, snake charmers and potion sellers here. Café Argana, Café de France and Café Glacier are some of the famous cafes here where delicious local cuisine can be tried in a warm and welcoming environment. Bahia Palace, the residence of the king of Morocco, is a very beautiful building. Many rooms of this extensive palace are open to the public, who are always fascinated by the picturesque architecture of this huge mansion. In addition, El Badi Palace has a name which means ‘the incomparable’ and visitors can happily spend hours touring this attraction. Other major attractions in the area include the Koutoubia Mosque, Majorelle Garden and Museum of Islamic Art and Marrakech souks. Spend quality time with the family making use of car rental to explore the area. There is a lot more to visit here in Marrakech. Menara Gardens is a beautiful place where more than 30,000 olive trees have been planted to welcome tourists from all over the world. Those who love to visit museums can go to Musée Dar Si Said, where they can see an outstanding collection of musical instruments, daggers, carved doors and beautiful kitchen implements. When it comes to unusual attractions that you are unlikely to find anywhere else, Marrakech has plenty and car hire makes it possible to see most of them during your stay. Marrakech Airport is 8.4 km away from downtown Marrakech. It will take +/- 20 minutes to travel from the Airport to downtown. When traveling to Marrakech we advise to carry some Moroccan Dirham MAD to avoid any unwanted surprises. At Marrakech airport there are Money Exchange offices in order to change your local currency. The local time code for Marrakech is WET. When traveling to Marrakech make sure to check the local weather conditions in order to avoid any unpleasant surprises. 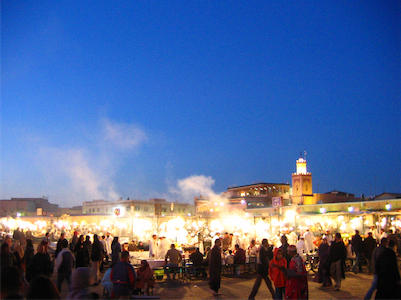 Marrakech has approximately 928,850 inhabitants. Marrakech Airport is a popular rent a car destination, there are many car rental companies in Marrakech Airport with a wide range of different car categories. Many of our clients have rented a car in Marrakech Airport and had good experiences. Do not wait with booking your car for Marrakech Airport before you know prices will go up and the availability will get low. Rentalcargroup.com offers car rental in more than 35000 locations, at all major airports and cities and railway stations. Below on this page you see a map with all the car rental companies we work with in Marrakech Airport. Last month, the average car rental length at Marrakech Airport was 7 days. The average rental car length at Marrakech Airport is 8 days. The most booked rental car type currently at Marrakech Airport is MINI cars. Last year, the most booked rental car type at Marrakech Airport were MINI cars. How much does it cost to rent a car at Marrakech Airport? Last month, the average car rental price was 200 USD. Last year, how much did it cost to rent a car at Marrakech Airport? Last year, the average car rental price was 199 USD. What is the current average daily price to rent a at Marrakech Airport? Last month, the average rental price was 29 USD per day. How much did it cost to rent a car at Marrakech Airport over the past 12 months? Last Year, the average rental price was 24 USD per day. The car rental companies available at Marrakech Airport are: Green Motion, Right Cars, Interrent, Locationauto, First car, Budget, AirCar. See below last 5 customer reviews. Our customers rated Marrakech Car Rental with an average of 9.50 based on 4 ratings. Renting a car through rentalgroup.com was extremely easy. traveling to morocco for the first time, i wasn't sure which company to use and who would be trustworthy or not, because you always hear so many horror stories but i am extremely happy that i rented with sixt. maybe their prices are slightly higher than others but their service was extremely pleasant, helpful, trustworthy and professional. it's a shame i can only give them 5 stars because i would gladly give them more, they deserve it. i hope this review helps those who are undecided. trust me, you're in good hands.